JLK Productions offers an excellent range of professional services including: tracking (recording), mixing, mastering, pre & post production, radio commercial auditioning, VO (voice over) recordings, audio medium transfer, video editing, producing, consultation, outsource marketing, album art work and more. We also provide high resolution (up to 4K) multi camera video recordings and live 32 track audio recordings right at your gig/venue. We are recording, editing and mastering using the industry standard of Pro Tools HD3 (version 8.1) and Pro Tools 11 thru 12.4. We have a great selection of high quality microphones, pre-amps, outboard gear and of course, the highest quality, award winning, plug-ins for our Pro-Tools system, have a look at our equipment list. We have a spacious 3 room recording facility on our property which includes 3 spare bedrooms(s) to accommodate out of town clients. Our extremely well laid out, productive recording environment helps us to get the best out of your creative side. 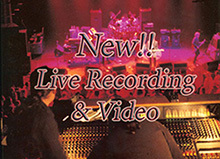 Our equipment, skills and knowledge will provide you with the professional audio and video production services you need. We are passionate about getting great sounds and a great vibe here in our studio and we know you will enjoy working with us as much as we will enjoy working with you We are trying to make this a recording studio that you will want to come back to. We will do everything we can to work inside of your budget. We are proud to be a smoke free studio, however, if you are a smoker, we will be happy to have an ashtray handy on our back patio. 1st Timers: If this is your 1st studio recording and you or your band are looking for a smooth recording session to get the most out of your time here, I've prepared a small list of recording tips, for you to have a peak at. If you follow some of these useful ideas, you will be sure to save a few bucks and feel more confident prior to and during your session. Video Production Examples Here are some examples of our video production video work. We are please to include to our outstanding list of services, professional video production. Our video services include video shoots, hi-def video editing and rendering, and almost all types of medium transfers, including: VHS to DVD. We are happy to work within your budget so call us for a personalized quote. Producers Agreements offer the best deals. Please inquire today.